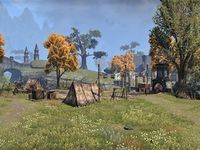 This article is about the crafting site in Stormhaven. For the crafting site in Grahtwood, see Fisherman's Isle. Fisherman's Island is an island in eastern Stormhaven, just east of Wayrest. The island is home to a special crafting site, where you may craft items in the Armor of the Seducer set.